We’ve been specialising in Stegbar sliding door repairs for two decades. At Adsafe Doors, we absolutely love Stegbar doors. 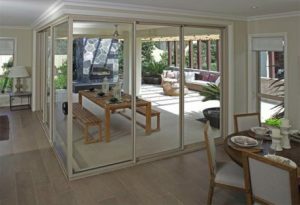 They are one of the highest quality sliding doors you can get in the Australian market. Click play on the video below to see the damage of the Stegbar door we fixed in Sydney recently. You will not believe how bad the tracks and rollers were. They have a rich and generous history going back to 1950 and have revolutionised a lot of the doors that you see in Australian homes today. As you can appreciate, with any high-quality door that is getting constant wear and tear, it is going to have some issues and challenges over time. That constant wear and tear wears away the internal components, breaks them down, and slowly disintegrates them. In particular, when it comes to sliding door repairs, not many people clean their doors on a regular basis. When we say clean your doors, we’re talking about the tracks underneath. A lot of dirt and grime and material gets stuck between the sliding door, the rollers, and the tracks. As a result, that drags over time and slowly wears it away. You may have found your Stegbar sliding door has dropped a little bit due to the weight of the door. In addition to the weight, the rollers and springs will have aged and won’t be holding the door up as it did originally. Nothing to do with Stegbar, but instead, it is more to do with a slow breakdown of the internal components. Time ages all mechanical and moving parts. All the Stegbar doors have springs and internal springs that are there to help keep that door floating on the track so to speak. What we find with each Stegbar sliding door repair is that we’re able to get in there and identify exactly what the issue is. Click play on the video below to see the before and after for fixing a Stegbar sliding door. Because of our rich history of repairing Stegbar sliding doors, we’re able to replace the internal components with the highest quality Australian made parts. This means we will have a look at the rollers and the sliding door tracks, which are usually the trouble spots of all Stegbar sliding doors. Just due to the time, and wear and tear. We’re able to go in and identify exactly what the most critical components are that need to be fixed. We will fix them and replace them with the highest quality parts. You can be assured that when we have fixed your Stegbar sliding door, that it will slide like new again, and you’ll be able to open and shut it with one finger. Not only that, but an often overlooked component of fixing Stegbar sliding doors is to make sure the locks line up correctly. This is critical because it’s your home and safety. At your home, security and safety are absolutely critical. Give the Adsafe Doors team a call today, and we will give you quote and time that we can fix it, and get your sliding door, sliding like new again.